FOF, fear of fish. Not JAWS. COOKING fish. Many people like fish, but hardly ever cook it. I get it. Fish is one of the most difficult proteins to cook, after eggs, because it’s so delicate and cooks quickly, leaving little room for error. The simple recipe below, while not completely foolproof, is very easy, uses just a few ingredients is and straightforward. It does, however, require absolutely fresh fish-find a fishmonger or a very reliable supermarket-and having everything ready before beginning to cook including a preheated oven. 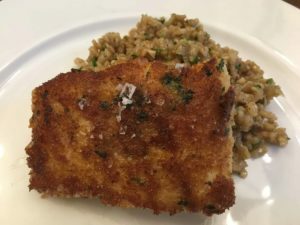 I am using cod loin here, the thickest part of the cod filet and very popular now, but halibut or any sturdy, flaking white fish will do nicely too. If you are unsure about a substitution ask the fishmonger and tell him/her how you will cooking it. Remember, the thicker the fish, the longer the cooking time in the oven. In this recipe, the cod is about 1” thick. You will notice that this fish cooks in 2 steps: 1) range-top for crispness and color and 2) oven for cooking through. Generally this is necessary for cooking a thicker fish because the fish will burn on direct heat (burner) before it actually finishes cooking. This dish is called “en persillade” which means, in it’s simplest form, a combination of bread crumbs, parsley and maybe some garlic and other herbs. Here, it’s another way of saying a crust of crumbs and parsley made crispy by sautéing in a bit of fat. So follow these directions and fish will start to become part of your home cooking repertoire. Put the crumbs and the parsley on a flat plate. Put the mustard in a little cup and have a small cup of water nearby. Season the fish lightly with kosher salt. 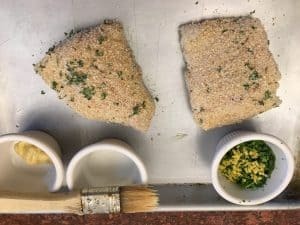 Dip a pastry brush in the water, then the mustard and brush onto one side of the cod (the water will thin the mustard slightly and make it easier to brush). Cover the fish to the edges, but don’t be heavy handed. Put the fish, mustard side down, into the breadcrumbs, pressing very firmly to make the crumbs adhere. Only cover 1 side with crumbs. 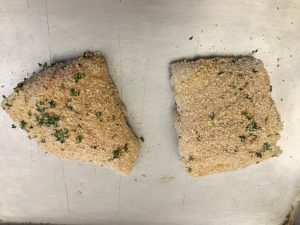 For the best crust, refrigerate the crumb-coated fish for about ½ hour. 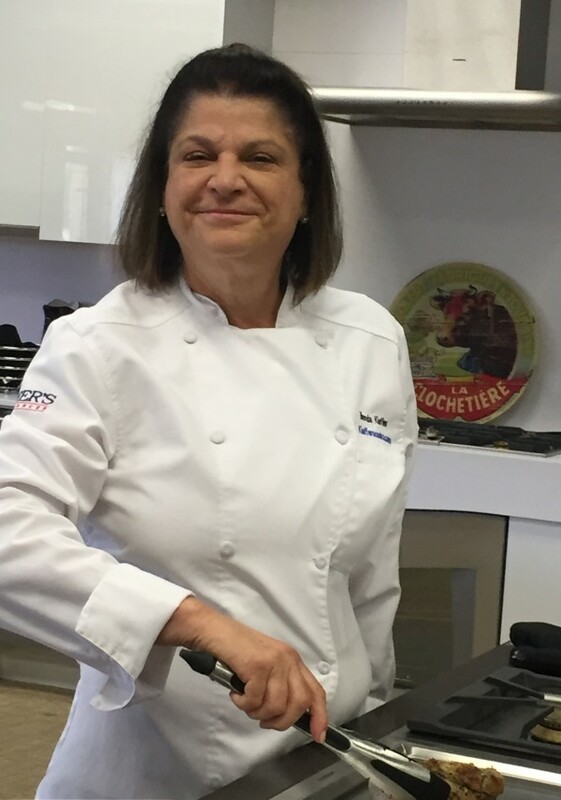 Meanwhile pour a film of canola oil into an ovenproof pan (cast iron is ideal) and heat over medium-high heat until the oil just begins to smoke. 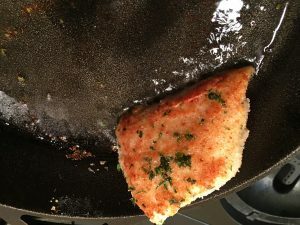 Lower the heat to medium and place the fish crumb side down and cook until the crust is golden brown-about 1 minute. 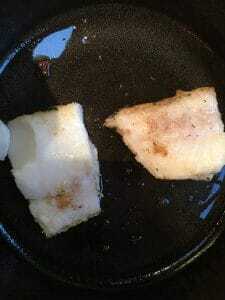 Transfer the pan to the oven and cook until the fish just begins to flake when a fork is poked into the corner. Sure, go ahead and test YOUR piece. About 9-11 minutes, depending on the thickness of the fish and the exactness of your oven temperature. 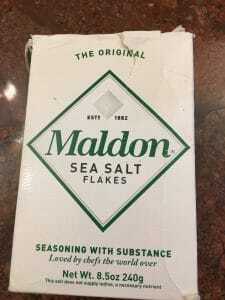 Arrange the fish on a plate/plates and sprinkle with a little Fleur de Sel or Malden salt and serve.